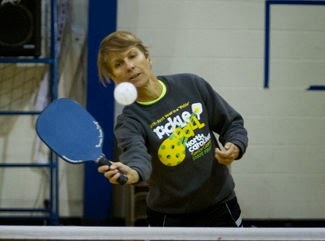 Pickleball is the fastest growing paddle sport in the country. Although it has been around since the '60s, it is just now catching on around the country and in many places around the world. But what is it and why is it so exciting? "First of all, it is a game played on a court half the size of a tennis court with paddles and a whiffle ball," said John Jessen, who runs weekly pickleball clinics at Transylvania County Parks and Recreation. "It has all the strokes of tennis, but you do not have to be a tennis player in order to play the game. That's one of the reasons it is so much fun." Anyone can learn to play. Players only have to cover an area about 10 by 15 feet, so less running is involved and the game is less stressful on the body.